"A man with demons is a loaded gun away from heartache...Sheri Davis' HAIR OF THE DOG is a short film packed with power both raw and brutally honest in the depiction of dealing with an alcoholic." 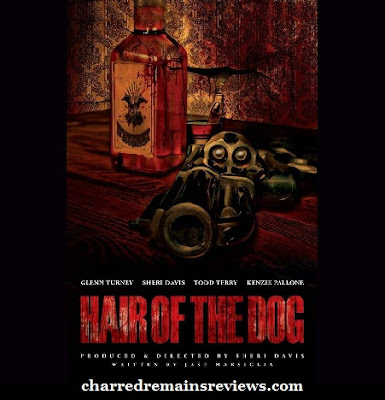 A man with demons is a loaded gun away from heartache...Hair of the Dog is a look into alcoholism and the consequences of a man who is in denial. The directorial debut for indie actress Sheri Davis is a nerve wrangling film that satisfied this reviewer with its story and the direction of main character John. John an average man suffering from alcoholism is in big denial of his problem. For him, the disease cost him his job and family and still he continued to drink himself into a stupor. I liked the way the film unraveled allowing viewer to see all angles of John's life and the consequences of the disease that he has allowed to ravage himself and his family. A peak at his picture perfect life as it crumbled around him. On a mantel the viewer sees pictures of his wife and kids and their smiles all melt away to a darkness that has consumed their happy essence and turned it to ruin. The end is both shocking and satisfying for family drama/thriller and even horror fans. The special effects that went into the ruin of John were excellent were both brutal and savage. I liked the "look" of the film. It flowed well even with the flashes from past to present, it was seamless. Set designs were flawless. A great eye went into making every detail stand out and looks like it belonged. I dislike films where the sets are thrown together and things that could have been added were left out. Not so in HOTD, kudos to the set designer. I had a few minor issues with the film that I will address. Sound continuity being the first thing I noticed. The film starts with music that blared. I had the settings on my computer set at medium and the music sounded two times higher and then it evened out for few moments just in time to hear the main character vomit and grunt. I can hear the past as he thinks back to what led to his current predicament, the tone of his boss and the crying of his wife...were perfect for setting of volume. As the film progresses the volume is fine and then in the kitchen after John pushes Crystal the volume is loud for her and daughter who yells at John, but then John's voice is so low, I have to turn the volume all the way up ( I could not hear John) and down throughout the altercation with John and Crystal as she and the kids leave. I'm not one that likes to adjust volume while watching a film, so for me the volume switching was a downer. Another was continuity dealing with scene shot outside during sunset. John is sitting on lawn drinking his Lone Star beer and its light outside moments later Crystal and the kids are making their way to the SUV to leave and it’s darker. I understand filming when you can, but when you go from light to dark in a matter of seconds as opposed to hours between shots...it's a little disconcerting. With independent lower budget films there are key factors that ruin a movie for me...acting, story direction, poor sound and shaking cameras. It's hard to hire above mediocre actors when the film's budget is poured mainly into equipment, location and FX. Acting usually takes a back seat...not so in this film. I was impressed with Glenn Turney's raw performance of John. His Jekyll and Hyde turnaround was scary and spot on with his story's character. He was believable as a drunk. Todd Terry played John's frazzled boss who had the displeasure of firing his employee. He made it perfectly clear that John was a hazard for his company and after a recent incident he could no longer turn the other way. Todd set the stage for more bad news to follow in the film. After viewing the film for a third time, I finally was able to place his face to a favorite night time show that has sadly been cancelled...DALLAS. I couldn't help but take a peek at his impressive IMDB page and sure enough in 2014 he played Peter Bedford on the show. I also recognize him from QUEEN OF THE SOUTH. Check him out! Kenzie Pallone had the difficult position of playing John's daughter Eve. She was forced into a situation to defend her mother and she showed this reviewer her dominance when she attacked her father for his mistreatment of her mother. Eve reacted quickly and her devastation was etched on her young face by the turn of events in her family life. There was one moment when her facial expression seemed to lag a bit too long in the kitchen, but was quickly recovered and smoothed over by her exit from the kitchen. I would like to see more from her as she matures in her craft. John's youngest child was adorable baby played by Maverick Cash. She cried on cue during a heated moment in the kitchen. Good set of lungs on that baby. Sheri Davis first caught my eye when she acted in another short film called SNAKE WITH A HUMAN TAIL from director Spencer Gray. Sheri played a transgender prostitute in a unique situation. You can read my review for more details. Shortly after this film, I had the distinct pleasure of meeting this remarkable woman at Texas Frightmare Weekend. She is a wonderful person and so good-natured, it is hard not to like her. In her directorial debut, I found not only a good story with a good cast but Sheri herself portraying an abused and fed-up Crystal wife to John. Sheri has a good eye when it comes to detail. I have seen her in other short-films that showcased her acting talent and after talking more with her, I know there is more to her than just a pretty face...Sheri Davis is a force that is a welcome site in a male driven profession. I have enjoyed seeing her first film and hope to see many more in the future from her. Trivia: Who else from Hair of the Dog starred opposite Sheri Davis in Snake with a Human Tail? A. Glenn Turney, B. Todd Terry, C. Kenzie Pallone. Disclaimer: I was asked for an honest review and I have given my opinions and thoughts on this film. It is my recommendation that reviewers of thrillers/family dramas should see this film and by the same way give their honest thoughts on Hair of the Dog as I have. Thank you to Sheri Davis for allowing me to review your film. My score is 3 Out of 5. Director has stated the sound issues have been edited for the final version circulating the film festivals. I heard the rumour before and didn't fully get the significance of it, then on a visit to a vet recently they gave me a badly photocopied sheet of dosage levels of some common anti histamines you can use for humans.